Right now, Mark is in possession of the entire script for the epilogue. This means that I'm officially done writing A Miracle of Science. The comic will still continue on until the end as Mark draws the last pages of the script. But other than proofreading the pages after he draws them, I'm pretty much out. We started working on this thing in 2001, which my handy calculator tells me was five years ago. It feels strange not to have to think about the dialogue for MoS. For the last quite-long-time, whenever I've had nothing else to do I could always sit and think about how Haas or Caprice or Chaucer should say something. I could redesign action sequences in my head. The plot had been completely written since before the first page was drawn, but the plot document is only a couple of pages long. It required fleshing out from story outline into actual lines of dialogue pretty constantly over the last several years. MoS always had a beginning, a middle, and an end. We didn't just get tired of working on the comic and decide to end it, or run out of funding. (I'm staring at you, every good science fiction TV show ever made.) This place in the story has been the end point since day one. So this shouldn't feel as surprising as it does. Good thing I have the next comic to work on. 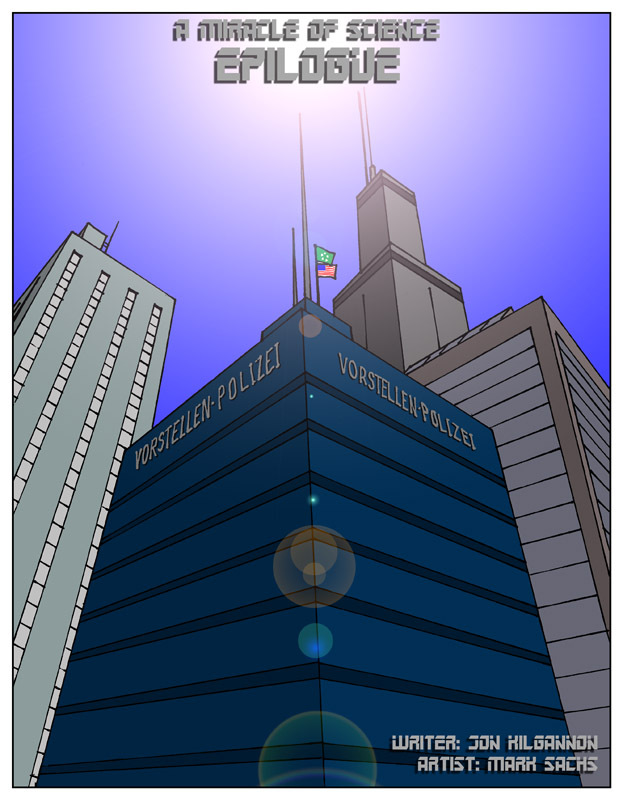 The Vorstellen Police building has appeared in this comic three different times and each time I drew it differently. You know what? That's a sign. We should just wrap this thing up -- oh, hey, whaddayaknow! It is sad that our little time together is drawing to a close, but there's still some amusing little details to wrap up and one highly important scene, without which the comic would not be complete. I think you'll like it. By the way, I wonder if anyone ever noticed the whole deal with the comic borders: for the whole comic (or at least the color part of it), they've always matched up with the planet or moon on which the current scene is set. White borders are the Earth or Ganymede. Black borders are outer space, or the Moon. Gray is Venus and orange-brown is Mars.